Decades ago a gamer might be satisfied with a simple console, controller, and couch, but the needs of the modern gamer have expanded far beyond those meager accessories. Now, gamers can find accessories, add-ons, and gadgets that suit their needs and make gaming sessions more comfortable, like the EWin Flash Series gaming chair. 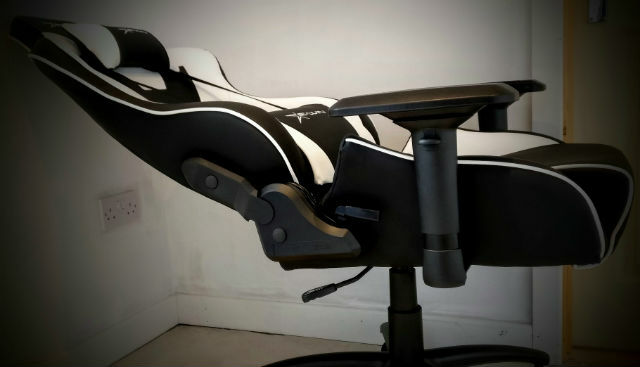 Plenty have probably heard and seen gaming chairs online, but they might not know what they offer beyond the basic computer chair. From a strict design perspective, the EWin Flash Series chair is extremely well made. It’s sturdy, well balanced, and it stands out in any office or gaming setup. The craftsmanship on the EWin Flash Series is impeccable, with a look that lets others know it is more than just the average computer chair. Assembly for the EWin racing chair is straightforward and only requires a few basic steps. There were no questions once the chair was put together that it was built to hold a considerable amount of weight, and nothing about it feels cheap or flimsy. In terms of its comfort, the EWin Flash Series is built for extended gaming sessions with minimal back strain. Its ergonomic frame ensures users are well supported and keep their posture. 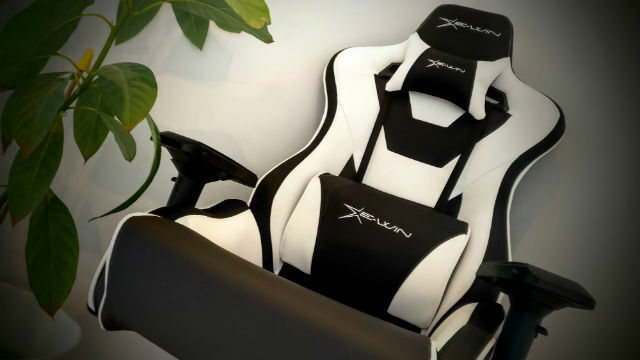 In fact, the EWin gaming chair is built to encourage correct posture, which is great for those gamers that have a tendency to slouch after an hour of playing. 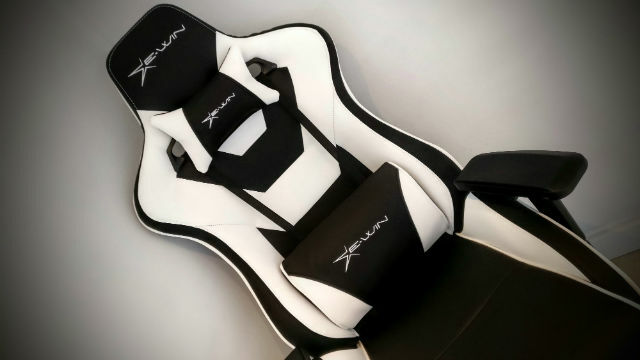 Additionally, the Flash series racing chair comes with two adjustable support pillows for the neck and lower back area. 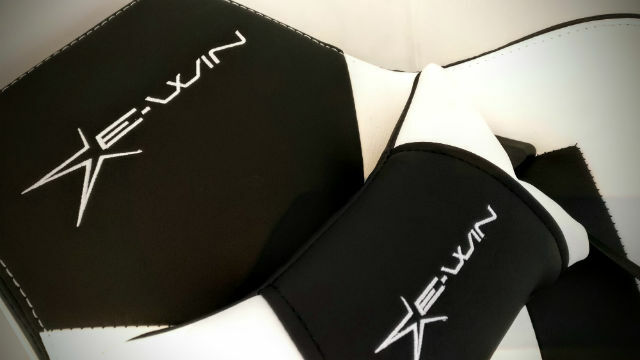 Without these pillows, the chair would still be extremely comfortable and supportive, but with them, the Flash series fits snuggly to the contours of your body and lets you relax while gaming. And for those that don’t want to sit upright, the chair can recline to suit a more laid back position, while still giving full support. Where the EWin Flash Series gaming chair does offer features similar to the average computer chair, it takes the basics and adds a lot more customization. The armrests, for example, have full range of motion – they can slide forward or back, rise up or down, or even flip around completely. Similarly, the seat can be raised or lowered to meet any desk or to match the gamer’s height. Where some might balk at the $399 price tag for the EWin Flash Series gaming chair, there is no question that gamers are getting a high quality product from top to bottom. Comfort is essential when it comes to gaming chairs, and those who spend hours sitting in front of a monitor or TV will appreciate the amount of detail EWin puts into its product. Coming from someone that tends to get back pain during longer gaming sessions, the EWin racing chair is a dream to sit in and I really appreciated that it encourages proper posture. Gaming chairs are obviously not going to be for everyone, but those that want to ensure top quality comfort (with a little style) should look into EWin’s Flash Series line. The EwinRacing Flash Series gaming chair is available on EWin’s official site for $399. Game Rant was provided a sample chair for the purposes of this review. Note: This is a review post from GameRant.